We had really beautiful weather this past weekend. Six of us rode on the breakfast ride Friday from Readfield to Winthrop, and another four riders took part in the ride from Smithfield on Saturday. Hope you all managed to get out and enjoy the weather. This Friday we will have a breakfast ride along the Rail Trail starting in Gardiner. Saturday's scheduled ride begins in Mount Vernon. Hope to see you then! "The Mount Vernon Traverse" - a tour through the back roads of Mount Vernon, Vienna, and Belgrade. START: 9 AM at the Mount Vernon Post Office; park down the street at the Town Beach across from the fire station. TERRAIN: moderate with some challenging hills. 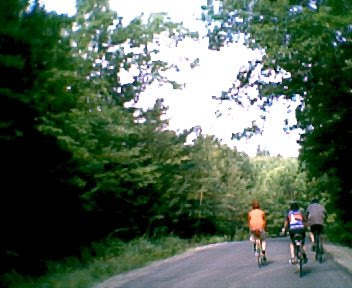 HIGHLIGHTS: Some nice backroads with a possible post-ride gathering and swim.